NO PLAIN BALLS FOR ME! ##JERK TURKEY BALLS!! It has been quite a while since I’ve consumed the feathery one in the form of chopped turkey. You see, I’ve been quite busy ‘surfing’ with salmon, shrimp and other seafood. So, since I’m back on the turf-side of things I thought I would pay a much-needed visit to dear turkey. I’m an equal opportunity kind of gal; so, I thought I would apply some of the treatment I generally dole out to chicken and meat and render same to some chopped turkey. There’s no doubt, I love a good dish of jerk chicken. So, seeing that turkey is from the poultry family, I thought I would go there with my balls (jerk turkey balls). And, that’s what I did. 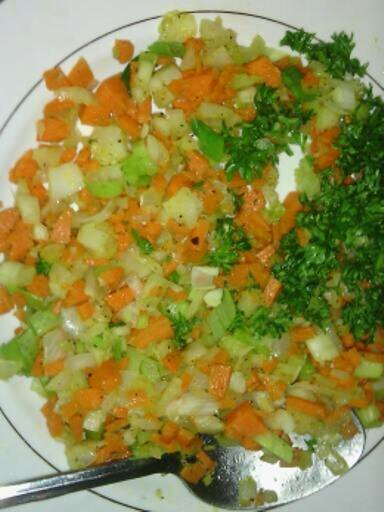 Vegetables were finely chopped and softened in a drizzle of olive oil. Then cooled. Cooled veggies were added to chopped turkey along with jerk sauce and squeeze of ketchup. In addition to black pepper, pinch of dried basil, finely chopped parsley,eggs, bread crumbs were added and folded without overworking . Balls were made and placed inside refrigerator in order to set. After balls came to room temperature, they were browned in skillet with a few teaspoon of olive oil. Then, they were placed in the oven at 400 degrees for 15 minutes so as to be cook internally. After completion in oven, turkey balls were drizzled with sweet and sour sauce and topped with julienned veggies that were stir-fried and soaked in sweet/sour sauce. 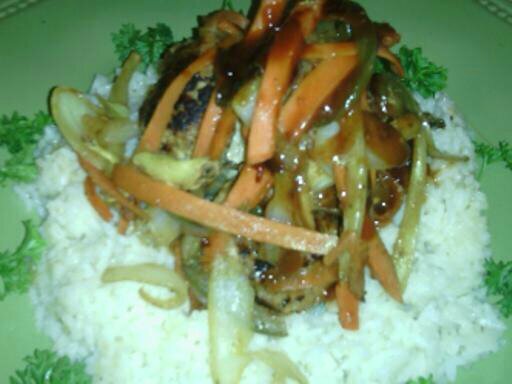 Jerk turkey balls were served over a bed of steamed Jasmine rice cooked in chicken broth and a pat of butter. The sweet and sour provided a beautiful contrast to the spicy jerk turkey balls. Moreover, the veggies had a delicious crispness to them. Jerk sauce can be purchased at any Caribbean (especially Jamaican) store as well as some supermarkets in the international/ethnic aisle. In regards to the sweet and sour sauce, I also got a little help from the store-bought version. To that I added a few ingredients of my own in the form of ketchup, honey, grated ginger, soy sauce and salt, black pepper.